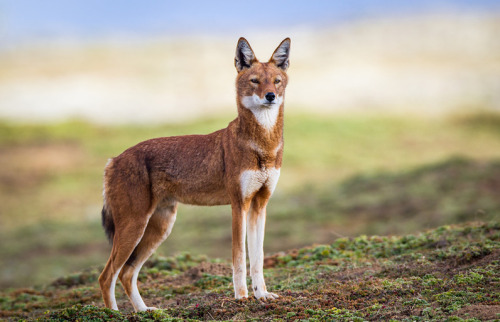 |Appearance| Ross is tall and thin, with an overall fox-like appearance. 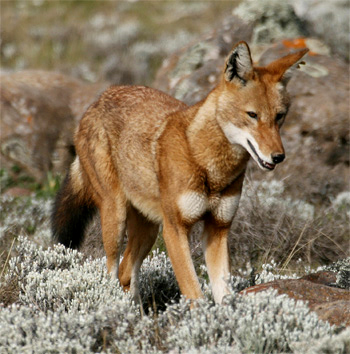 She is slightly larger than other female Ethiopian wolves and a few inches taller. Ross has long legs, with red on the outside and white markings on the inside. She has a dew claw on each forefoot, and all her claws are a dark, ruddy brown. Her paws are comparatively small. She has white markings on her neck, chest, feet and tail. Near the end of her tail is a dark streak. Her eyes are almond shaped and piercing yellow in color. She has large, foxy ears and a long, pointed muzzle. Her neck is long and flexible. Her body is lean and lanky. Her tail tip ends at her hocks. |Special Markings| She has a small white diamond shaped marking on her forehead. |Accessories| She wears a silver chain around her neck. |Honest|Sarcastic| Ross is honest to a fault and can be very blunt. She gives off the impression of being insensitive about others even though she doesn't necessarily mean it. She can have a cold shoulder and will go numb to others as a defensive mechanism if she doesn't like or trust you. She doesn't lie to people and doesn't see a point in it. She also has a deadpan/sarcastic/smart aleck sense of humor due to her honesty. She is not afraid to speak her mind and this can lead her into trouble. Some like her for her trustworthiness and yet others don't like her for being so upfront. You either like her or you don't and she doesn't really care which way you go. |Sigma|Unpredictable| Ross has a definite Sigma personality. She avoids social circles and social hierarchy in general. She has no care for social consequences and can be antagonistic towards creatures she doesn't like. She has no desire to lead others, and yet, she has no desire to be led. Even though she isn't an up front leader, she can lead indirectly and is very good with manipulating others. She can be intimidating and has a tendency to glare at others without meaning to. She likes to be her own individual, with no restraints or hindrances. She doesn't do very well in relationships because of its restriction on her freedom. It's safe to say you will never know what she is going to do. Flirt|Tease| Ross will, if she likes you, probably flirt with you. If you start getting on her nerves, she will give a dose of insult with her flattery. When she flirts she never intends for the interaction to go any farther. She doesn't like players or being used. If she thinks an individual is using her, she will cut off interaction with said person and forget about them. If she does like someone, she will tease them good naturedly. You will know if she doesn't like you right away. She has smart mouth. |Intelligent|Prankster| Ross is very smart and will likely show it in conversation. She loves random facts and trivia and is generally knowledgeable in a variety of areas. She is a good listener for others and genuinely cares about their feelings. She is not good with expressing her emotions in words and would rather show them to others. She loves a good conversation or a friendly debate amongst her peers. On occasion she will engage in a prank or an amusing joke on/for/with others. |Polite|Temperamental| Ross has manners and will be well-mannered in front of others. She has class and she exhibits it to her full potential. She is proud and always holds her head up high. She avoids looking down on others and tries to keep an open mind. She's a fan of please and thank you. Even though she is well-mannered on the outside, inside she has a horrible temper that she regularly has to keep in check. She tries to keep from getting mad around others, because once she starts its hard for her to stop. She's a skillful fighter, but usually prefers the use of her tongue and wit over strength and physical contact. |Laidback|Practical| Ross has a go-with-the-flow attitude and doesn't like direct conflict, but she isn't afraid to stand up for herself and be assertive. She gets along with most individuals in general. She can keep a grudge though if she is displeased by others, as she holds herself, and others, at very high standards of conduct. Though she has high standards, she does try to keep her feet on the ground and realize that no one is perfect. People make mistakes and she's aware of that, she's just not too fond of admitting to herself when she makes mistakes. This happens often as she will take things at face value and has a reputation for judging a book by its cover. |Loyal|Stubborn| If an individual wins Ross's trust, they will have a friend for life, through thick and thin. Her loyalty is strong and almost unbreakable. However, if you break her trust, she will forget about you entirely and you would be better off dead to her. She doesn't take lying well and you will regret it if she catches you. She is stubborn in her beliefs and ideas, and is not easily swayed in her opinions. Arguing with her is almost pointless, but she is a good negotiator and is usually open to compromise, instead of a complete idea change. Ross was born into a small pack with only a few siblings. Her father had the wandering blood in him and soon left his mate and his litter of pups. Her mother took very good care of them and they grew up, strong and proud. The wandered around, looking for a pack to join and quickly succeeded. Ross was content with this life for a while, but inside she had a deep urging to continue on. She left them and stumbled across the city by accident. She quickly grew accustomed to it and found other wolves that inhabited the city. She noticed in each one of them certain traits, and these wolves became the birth of the Factions. She soon became the leader of those who didn't fit in with either Faction or who had more than one dominant Faction. The Factionless and the Divergent. |Likes| Hunting, running, friendly conversations, manners, honesty, intellectuals, flirting, solitude, small social gatherings. |Dislikes| Romantic encounters and situations, rude, obnoxious, ignorant individuals, arguing, whining,complaining for the sake of complaining, following orders, agreeing to something she doesn't actually agree with, being angry, being objectified, being downgraded.